The new Jon Lord book from Rufus Stone has been shipping over the last few weeks. I think anyone who ordered this will be pleased with the results overall. I wasn’t sure how the book would end up given the many different approaches the publisher could have been taken, and the numerous people who inputted. In the end they’ve gone for what you might call an upmarket family album concept. Happily they have resisted the temptation to follow this through and add fake photo corner and other clip-art design elements (see History Hits & Highlights DVD ‘booklet’! ), but kept things on a cleaner level design wise altogether. Yes there are graphic effects in each section, but they’re never overdone. This allows the actual photographic content to stand out. The book’s opening section is perhaps one of the most poignant, with a lot of never before seen early images of Jon from his family archives. It’s the sort of material many families hopefully have safely tucked away in an album (or biscuit tin), but when it’s related to a person who you think you know from their public image, it forcably brings it home that behind the rock persona was a regular guy with interests, dreams and ambitions like the rest of us at that age. Jon as a young child walking down the street with his dad, dressed in school uniform, is a gem. Back then school uniforms were not cheap and many parents made their kids wear them to look smart on family trips (as my own family pictures testify). It’s one of those everyday images taken by a commercial street photographer; you went and collected your souvenir print at the end of the day and paid your 2/-. We move on to Jon’s early days at drama college. Many will know he harboured plans to be an actor but it’s great to see these photographs and wonder what might have happened had he stuck to treading the boards rather than subjecting them to the weight of a Hammond. Instead the piano called as a way of helping him pay his rent and The Artwoods quickly took over. A few nice shots here though I would have liked more – but then they are one of my favourite pre-Purple bands. We’re then straight into Deep Purple. Again as the publisher has taken the photo album approach, we’re not subjected to too many of the familiar images. Instead there are some high end images and batches of snapshots taken on the road or in the studio. Very personal shots taken with often low fi camera gear and printed off at the local photo lab back home for printing and developing. What some of them lack in quality they more than make up for in atmosphere and intimacy. As each section progresses there are written pieces by people who were on the scene at the time, giving us some of their memories of working or touring with Jon. Some we have heard of, others may be less familiar, but it all helps build a picture of Jon from those who knew him best, rather than the Jon we knew mostly from music paper interviews. Whitesnake loom, and then give way to the Deep Purple reunion, which again is mostly represented by off-stage and rarely seen material. The final section concentrates on Jon’s work of the last decade. Is it me, or does he look more relaxed here away from the stresses of touring so heavily? I think it’s one of the things we can be most grateful for as fans, that Jon took the decision to give Deep Purple up and spend ten years or so exploring and pushing his boundaries as a musician. It hurt to see him go, but what we lost in his contributions to a couple of Purple albums was more than made up for in the scope of his projects over that last period. We could wish for more, but it did at least provide a fitting coda to his musical career. One of Tony Ashton’s idiosyncratic drawing of Jon at the Hammond closes the book. In terms of production quality the book has all the hallmarks of the beautifully made artifacts which we associate with the publisher. I have seen some of the efforts from other high end rock book printers which cost twice as much and don’t come up to this. The purple velvet finish could have looked cheesy but with the very simple gold blocked signature inlaid just works really well. Any gripes? Well without wanting to sound greedy there is room for more images while a few of the photos do cut across the spine which always annoys. I’m not sure why there is the need to have the Concerto sleeve full page either, most buyers of the book will already have that to hand. A couple of shots are perhaps enlarged well beyond what their photographer ever intended be the case, and for me a decent timeline would have been a useful extra for buyers. Interest declared: a couple of my photographs do appear in the book (as well as what look rather like some of my bits of memorabilia!) and in return RS kindly sent me the review copy. RS are having a competition to win the 001 numbered copy, check their website. With the cost running at $805 Cdn, it is regretful that I won’t be able to purchase it. I actually signed up to the payment by installment plan and at first asked for 4 months but then re-email to request 5. Mark said he’d get back to me and never did! (I assumed the number of months was too much for him). It would be great if in time this book could be made available in a more “economy” wised fashion! Any pull or means of persuasion toward Mark and the people of Rufus? They have said the LE is the only version, but I can do the asking! I received the email sent by Rufus Stone announcing the competition for best Jon Lord photo. Upon clicking the video link advertising this book, “All Those Years Ago” As soon as I watched a few seconds, I thought I don’t remember that shot, and promptly got my copy of the book out and sure enough.. not in there! 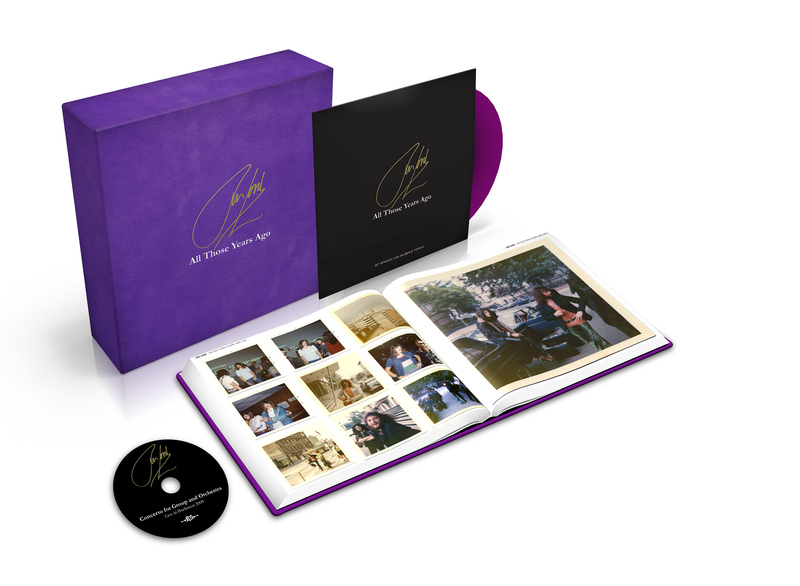 This new video has a bunch of Jon Lord photos that did not make the book. I doubt there will be a Vol. 2 but have a look. I know the family were very involved in making the photo selection so it may be these are images they didn’t want in the book for some reason.